Although you are likely to do this almost daily in the summer months, it’s important to remember to open your windows and doors during the winter months too. Minor problems that are left unchecked throughout the winter can really take hold and lead to expensive repairs during the summer. Simply open your windows and any doors you may not regularly use during the colder months to check that they move freely and smoothly on their hinges or sashes. If they creak or rattle you can quickly and easily resolve this by oiling the hinges or using a cam action fastener to draw the sashes closer together. However, if your windows are sticking you should be mindful that although this may just have just been caused by over painting, it could also be a sign that the frames have become swollen or distorted. If applying beeswax or tallow to the edges does not resolve the problem you should consider getting in touch with us so we can carry out checks and offer further advice. It’s all too easy when checking period windows and doors to forget those all-important joints. On at least a quarterly basis you should make a concerted effort, whilst opening and closing the doors and windows, to thoroughly inspect the joints. You should look out for any telltale signs such a cracked or peeling paint, swelling or crumbling and they should feel firm and secure when pressed; if they do not this could be indicative of damp and rot. At least once a year you should undertake a full inspection of each and every door and window in your property; inside and out. Take this measure to ensure you don’t overlook anything and this is best carried out in an orderly and methodical fashion. Creating a checklist for each window and door may help. The checklist should include the checks that you would have already made on a monthly and quarterly basis. 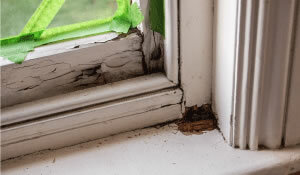 Further, you should also inspect the putty in the windows and, if necessary, replace this with a traditional linseed putty if it appears to be loose or damaged. Under certain circumstances applying putty can be a cost-effective solution to replacing a window pane but if you are unsure then the best advice would be to contact a member of our team. Finally, always inspect the frames and the whole of the sill for rot, paying particular attention to the underside where water may collect. A pen knife is useful for checking this. If by lightly pressing the blade of a penknife into the wood it flakes away, feels spongy, or more than the tip enters the wood, this is a sure sign of rot and this should be dealt with immediately; don’t be fooled by the appearance of the wood – often a good coat of paint can’t hide the fact that the wood is actually rotting beneath.